Description: Through the West Bottoms comes yet another coal empty with 10 engines on the head end. Description: BNSF Northbound Empty Coal Train awaiting a fresh crew at Quinton, Al. as a Loaded Coal Train awaits being dumped at Plant Miller at Palos, Al. Description: DPU slides by as coal empties enter the Soco Yard. Description: In a scene repeated dozens of times daily a loaded coal train heads east (south) on the BNSF St Jo sub; this time led by SD70ACe 9277. It will hold for two westbounds at Waldron before entering KC. Description: BNSF SD70ACe 9277 passes one of the last remaining CB&Q signal bridges on the Mendota Sub on the north side of Galesburg. Description: Loaded BNSF Martin Lake coal train C-BKMMLM0-13 departs Lincoln on the St Joseph Subdivision at Park Blvd. BNSF SD70ACe 9277, 122 loads, 2 empties, 17471 tons, and 6730 feet including rear DPU locomotive BNSF ES44AC 6002. This train is en route from the Buckskin Mine in the Wyoming Powder River Basin to utility Luminant Generation Company LLC in Martin Lake, TX. This train will operate over the KCS between Kansas City, MO and Shreveport, LA. 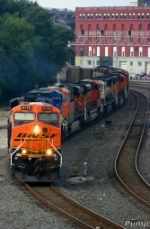 Title: BNSF 6346 Leads a Nb empty coal train. Description: Nb empty coal train heading thur town about to meet the local heading Sb. Description: Norfolk Southern Coal Train 737 makes their way Westbound as they pass through 32nd Street in Birmingham, AL. Description: BNSF 9523 - BNSF 9277 likely a pusher pair in Rozet, WY on yet another coal drag. Photo credit (yup) to Cheryl at freeway speed, snapping out her window. Description: Coal train waiting at Bayside due to Delta being packed. Description: BNSF 9277 is the DPU to BNSF 9385 with the TXUX empty coal train headed into Hobson, approaching Salt Creek on 7/15/2017.